During the summer of 2016, Sharon M. Leon and Sheila A. Brennan led a second Doing Digital History institute for advanced topics in digital humanities (IATDH) funded by the National Endowment for the Humanities, Office of Digital Humanities together with an amazing team of graduate student mentors and visiting scholars. The final report and white paper is available. Doing Digital History 2016 offered 24 mid-career American historians an opportunity to immerse themselves in two intensive weeks of training focusing on the theories and methods of digital history. The results of the institute were impressive, with participants increasing their technical skills, their digital literacy, and their comfort with evaluating digital work. The team was able to rely on the lessons learned from 2014 during the planning and design phases of the curriculum and the evaluation structure for 2016. By the end of the two weeks, everyone left with new skills, new understandings of digital methodologies, and a new appreciation for the work required to build and sustain successful digital humanities projects. If you were asked to review a digital project for a professional journal in your field of expertise, would you feel comfortable saying yes to the request? If you were asked to review a colleague’s digital work for promotion, would you feel comfortable assessing its scholarly impact? Do you feel comfortable presenting or discussing digital history work with your colleagues? Do you feel comfortable supervising students who want to use digital tools in their history scholarship? By comparing the 2014 and 2016 institute data, we can see some interesting differences in the cohorts. Prior to DoingDH, the 2016 cohort was much more comfortable reviewing digital work for promotion than the 2014 group, but less willing to review digital projects for journals. The 2014 cohort was slightly more at ease in supervising students incorporating digital tools into their work, and more than half of each group felt comfortable discussing digital work with colleagues. The post-institute surveys show that the 2016 cohort left with more overall confidence across each goal and achieved slightly more positive change in growth than the 2014 group. Even still, both groups experienced an impressive amount of personal and professional growth in two weeks! The results are impressive. Our other aspirations of moving the field will take longer than a year and will require some additional research in a few years to more adequately assess the long-term impact. After finishing our second IATDH introduction to digital history, we can affirm some of our findings from our 2014 white paper. Based on the applicant pools from 2014 and 2016, we see that there are still relatively few training opportunities at the novice level for faculty, and yet, it has not prevented history departments from asking their faculty members—prepared or not—to teach digital history courses. Preparing faculty to teach these courses, just like in public history, means more than simply reading the literature. It’s a methodological shift and we continue to believe that it is irresponsible of departments, colleges, and universities to assign faculty to teach digital history courses without providing the time and resources for professional development. Interestingly in 2016, we received more applications from junior faculty and new PhDs seeking digital training to prepare them for the job market, because their graduate programs offered no courses or opportunities to learn digital methods. Some of these applicants wrote desperately hoping that they could participate in DoingDH 2016 to help them obtain a tenure-track job. The Doing Digital History institutes are an effort to provide scholars with a very preliminary introduction to the theories and methods of digital history. As such, they are only a beginning. Our evaluation shows that they have made a significant impact in the field, but we all have much work left to do to raise the digital literacy of the core of mid-career colleagues. 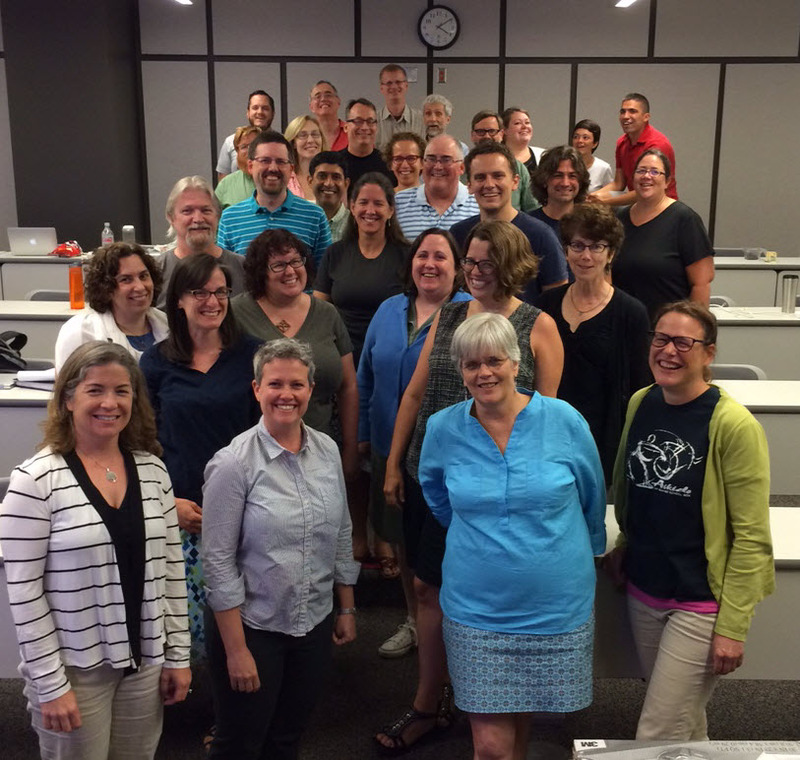 An amazing cohort of historians came to RRCHNM’s Doing Digital History 2016 in July as self-identified digital novices, unsure of their abilities to keep up with the work during the two-institute. They all left with their own web domains, experience working in the statistical programming language R, and many ideas for new teaching assignments, research projects, and digital publications. Most important, each participant became more confident engaging with and reviewing digital scholarship, advising students wishing to do digital projects, and in learning to tinker with and ask questions of digital methodologies. Throughout the two weeks, readings and discussions were coupled with demonstrations and hands-on work. Each participant established their own web domain, installed open source software (WordPress, Omeka, R, Audacity); implemented best practices for managing their research; made visualizations; built simple maps; learned how to plan a digital project; edited sound files, planned digitally-inflected lessons for their classes; and considered the implications of the changing field of scholarly communications. Participants and team members worked in public throughout the institute. All readings, assignments, tutorials, and participant blog posts are contained with this website. And, we created a PDF of the entire DoingDH-2016-Curriculum for sharing and distributing under the CC BY-NC license. Additionally, the Twitter backchannel conversations using the #doingdh16 hashtag are Storified for a different perspective of each day. Doing DH benefited from an enthusiastic corps of RRCHNM graduate students, Alyssa Fahringer, Eric Gonzaba, Jannelle Legg, and Spencer Roberts, who developed tutorials and use cases for incorporating different digital tools into teaching and research. They also provided moral and technical support to the participants, and managed the Twitter backchannel. Doing DH also featured guest instructors from Mason’s History and Art History Department, Mason Library, and neighboring institutions. Lincoln Mullen shared his extensive expertise doing computational research over three days and Michael O’Malley led a day on sound studies. Jeri Wieringa of the Mason Publishing Group shared trends in scholarly communications and digital publishing initiatives. Denise Meringolo, a participant in Doing DH 2014, returned to discuss how her public history work at University of Maryland, Baltimore County, became digital. And, Jeff McClurken visited from University of Mary Washington to lead a day on digitally-inflected pedagogy. By the end of Doing DH 2016, participants were tired, but also invigorated with ideas and three action items to implement over the next six months. The Doing Digital History team is pleased announce that participants for the 2016 Summer Institute have been selected. This year we received 69 applications from highly qualified individuals working at a diverse range of colleges, universities, and public institutions. This significant interest demonstrates a high-demand for training for digital novices. We are excited to welcome 25 mid-career historians from across the country to the ten-day summer institute from at George Mason University’s Arlington campus on July 11-22, 2016. This institute is once again generously sponsored by the National Endowment for the Humanities, Office of Digital Humanities and organized by the Roy Rosenzweig Center for History and New Media. For information on the previous institute, please visit Doing Digital History: 2014. Apply now for one of 25 available spots for the Doing Digital History: 2016 summer institute to be held July 11- 22, 2016 at George Mason University. The institute is organized by the Roy Rosenzweig Center for History in New Media and generously sponsored by the National Endowment for the Humanities, Office of Digital Humanities. Doing Digital History: 2016 is designed to fill a much-needed gap for established historians who need instruction and a professional learning community to engage with new media methods and tools. We seek applications from faculty, public historians, archivists, librarians, museum professionals, and independent scholars specializing in US history, who have had very limited or no training in using digital methods and tools, or in computing, and who lack a supportive digital community at their home institutions. Applications will be open until March 15, 2016. We are pleased to announce that the Roy Rosenzweig Center for History in New Media at George Mason University is organizing a second Doing Digital History summer institute in July of 2016 aimed at mid-career American historians. This institute is once again generously sponsored by the National Endowment for the Humanities, Office of Digital Humanities. Doing Digital History 2016 is designed to address the existing gap in digital history training for established scholars who need instruction and a professional learning community to explore digital methodologies and theories applicable to their historical research and teaching. We will seek applications from faculty, public historians, archivists, librarians, museum professionals, and independent scholars specializing in US history, who have had very limited or no training in using digital methods and tools, or in computing, and who lack a supportive digital community at their home institutions. If you are interested in hearing when applications will be open, submit your contact information using the form below.